 What might the following dog movements have in common? Ears back, lip licking, yawning, head turns, paw lift, backing away. They are all behaviours that dogs use to ‘communicate’. If some or all of the above behaviours are happening together, your dog may be telling you he isn’t comfortable in a situation. Unfortunately, most humans don’t speak ‘Dog’ fluently so we miss what Fido is trying to tell us. As with all behaviour though, context is important – we need to look at what the dog’s whole body is saying. For example, every time a dog licks its lips, it doesn’t necessarily mean he’s anxious; a dog may lick his lips after eating! But when we start noticing these subtle signals in context, you’ll understand your dog soooo much better. For example, the dog that turns away from a child (or adult!) trying to pet it, may well be saying, “I’m not keen on this, please stop”. Chirag Patel (Animal Behaviourist & Trainer) gave a talk recently about dog communication; I’m sharing some of his pearls of wisdom so you can build an even stronger rapport with your dog. 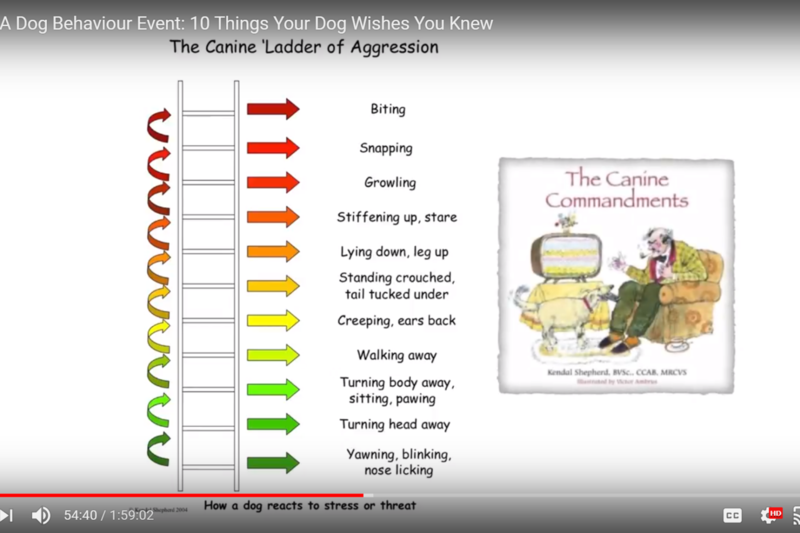 Kendall Sheppard, a veterinary behaviourist and author of “The Canine Commandments”, suggests there is a “Canine Ladder of Aggression”, see below. It’s a handy little infographic to help humans learn to speak ‘Dog’ … and understand that dogs don’t bite for ‘no reason’. The picture shows a range of behaviours that dogs use to indicate they are anxious or uncomfortable. Some dogs may not show all of the behaviours, nor necessarily in this order, but its a useful analogy. The behaviours at the bottom of the ladder are a bit like the dog whispering. As you go up the ladder, it’s the dog is saying ‘no really, pleeease stop’. The next escalation point may be to ‘shout’. And if that doesn’t work – teeth may get involved! The ladder shows that dogs usually give lots of warning signals before a snap; it rarely happens ‘out of the blue’. The problem is that humans struggle to see (or respond to) the subtle signals … but we do notice a growl. Look how far up the ladder the growl is though. 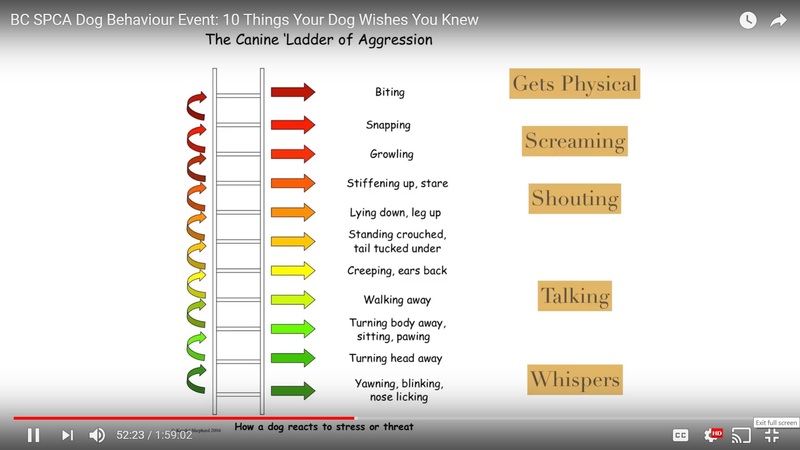 Think how stressed your dog is by the time he escalates to that point. And worse still, consider the consequences of punishing your dog for growling? Its as though you’re saying “don’t give me a warning that you’re at breaking point.” So, you may find that next time he doesn’t – and goes straight to bite. Inadvertently, we can end up training our dog that shouting and screaming (ie growl, bite), gets people to ‘listen’ and makes the scary thing go away. The result? A dog labelled ‘unpredictable’ or having a ‘short fuse’. When actually, the dog used to give lots of warning behaviours but we didn’t listen. So, try to notice your dog’s ‘whispers’. Teach Fido there’s no need to ‘shout’. And if in doubt, get your dog out of the situation (better safe than sorry). 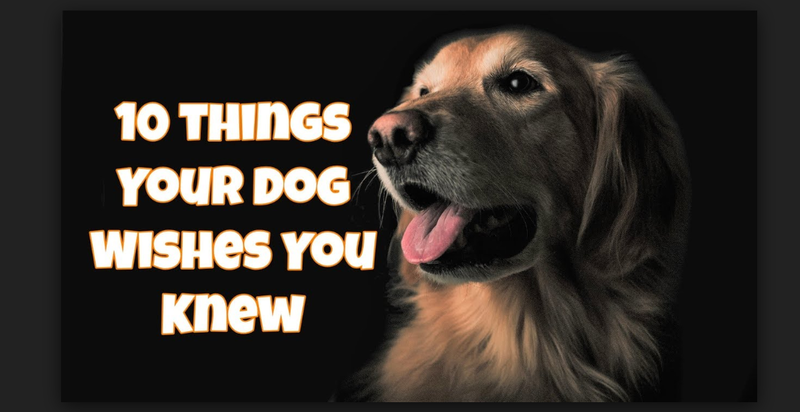 You can listen to Chirag Patel’s talk for the BC SPCA on YouTube here its called “10 Things Your Dog Wishes You Knew”. (Scroll forward to 18mins 50 seconds that’s when Chirag comes on). You can also read more about how dogs use “calming signals” here.